I finally got Temper to work on Ti nspire ! It is much faster than Hugo though. Also I wonder if any CD game will fit at all . Aren't most early CD games using WAV-like music files that have no lossless compression? I think Ys Book I & II is like 515 MB. Temper is for emulating the Pc Engine / Turbografx. If I remember well, you already ported Hugo which targets the same hardware. So in which way is Temper better or worse than Hugo ? I would say it is better. For once, it has a menu. I personally tried Megaman by PCEDEV and it seems to run fairly smoothly. Also, the controls were not properly mapped : it's fixed too. Quote Also I wonder if any CD game will fit at all . Aren't most early CD games using WAV-like music files that have no lossless compression? I think Ys Book I & II is like 515 MB. They can fit, if you remove the CDDA tracks and remove the WAV info from the cue file, which is pretty easy to do. For games that do use compressed music, you can use a ISO editor and just dummy it out. But for games that relies on heavy cutscenes... well, there's not much we can do. You just can't expand the NAND so easily. Hm I'll check then. Are there any free tools to remove WAV files from cue files? Years ago I remember having an hard time just trying to find a freeware (not shareware/trial) ISO mounting software, so I can't imagine how hard it would have been to find one that lets you edit them too. Will some games crash if audio files are missing? Hm I'll check then. Are there any free tools to remove WAV files from cue files? See what i did ? I removed all the audio tracks info from the cue and deleted the accompagning wav files along with. Quote Years ago I remember having an hard time just trying to find a freeware (not shareware/trial) ISO mounting software, so I can't imagine how hard it would have been to find one that lets you edit them too. If you're looking for a decent ISO editor, there's UltraISO on Windows that does the job pretty well. You might be able to open some iso files with 7zip too. Quote Will some games crash if audio files are missing? For CDDA tracks, no, they will still work even if you remove them. If you are removing audio files inside the ISO however, yes, it could happen, even if you dummy them out. Well, the last time I tried mounting an ISO file was back in 2009. Back then I did multiple Google searches for alternatives to Daemon Tools and out of a dozen of alternatives, only one was Free. The rest were all paid or trial versions with severe limitations. So I imagined that if I also wanted the ability to edit that it would be even worse. I mean, you know in what capitalist world we live in, right? Anyway I'm glad that I was wrong (or at least, I'm glad that things changed) and that I can do it the way you described. All the tools i need, and yes including ISO mounting thanks to cdemu, are free and open-source. it doesn't deny my freedom to pee whetever i want or asking for monez. Quote Anyway I'm glad that I was wrong (or at least, I'm glad that things changed) and that I can do it the way you described. Don't forget to add the ".tns" extension inside the cue file (like i did) and to the iso file as well. 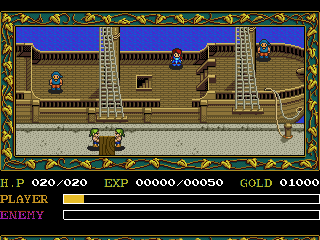 Some CD games like Ys I & II did not work before... Of course, they are now working. And yes, i tried it, it does work real hardware ! Unfortunely, removing CDDA tracks is actually more complicated than i thought it would be. The only way found to achieve that was to use bincuesplier provided with WiiEngine. Then i get the generated bin file (16.6Mb for Ys I & II) and i create a cue file for it. And then i can play it. Supergrafx games should also work on it. Ys: Best game series ever (or almost). I am unsure if I will go through the hassle, but it's nice that it's now possible to get that classic to work on a TI-Nspire. The only downside is that the music is the best part in any Ys game by far, so playing those games without music makes you miss out on a lot. But it's still fun nonetheless. Not a huge fan of Ys's gameplay but i loooove ys pron. Quote The only downside is that the music is the best part in any Ys game by far, so playing those games without music makes you miss out on a lot. But it's still fun nonetheless. A shame really, as i even got the otg adapter and usb audio stick ! Well, Ys is quite primitive compared to other games, especially the older games. You run through enemies to attack them, for example, and unlike Final Fantasy where you get 200 different items, in Ys you have 20 max, with about 3 magic spells. However for some reasons they still managed to make them fun. My only gripe about the older Ys games is that on the NES and SNES they are super-ultimate-mega-ultra-giga-bats***-motherf***ing hard. Unless you have the exact level requirement+armor to beat an enemy, you die in two hits and if you have one too many levels, then it takes 200 kills to level up. At least the PCE ports are more balanced. This is something i need to check out. But anyway, i have released a minor update to Temper. It's smaller and slightly faster. I'm still looking for someone to switch the input code to native as it's harder than i thought it would be..
Actually, some Ys Book I and II and Ys III tracks use the soundchip as well. Could this be problematic?